These aren’t your average veggie burgers! Cannellini beans are rich and creamy, and parsley, lemon, and red pepper flakes add loads of brightness. A briny aioli and fresh fennel slaw make these burgers shine, so don’t be shy topping them off. Our two secret ingredients to keep these bean burgers from falling apart are the ground flax seed and chickpea flour, which add extra protein to boot. Rinse, dry, and zest the lemon with a microplane or grater. Drain and rinse the cannellini beans. Rinse the parsley, remove the leaves from the stems, discard the stems, and roughly chop the leaves. To the bowl of a food processor, add the parsley, the lemon zest, beans, 2 cloves of garlic (setting 1 aside), red pepper flakes, ground flaxseed, chickpea flour, and 1/4 tsp salt. Pulse until just combined. Rinse the fennel bulb and trim the dark green stems. Cut the v-shaped core from the bulb and discard core and trimmed stems. Thinly slice the bulb. Halve the zested lemon. Place the sliced fennel into a large bowl, and add the juice from 1/2 the lemon, 2 tsp oil, and a pinch of salt and pepper. Toss to combine. Drain and chop the capers. Mince the remaining clove of garlic. In a small bowl, combine the chopped capers, minced garlic, vegan mayonnaise, the juice from the remaining half lemon, and a pinch of salt and pepper. Stir to combine. Place a large nonstick skillet over medium-high heat, and add 1 tbsp oil. Divide the bean mixture into two equal portions and form into patties. Cook the bean burgers until golden brown on both sides, about 3 to 5 minutes per side. Cover, and remove from heat to keep warm. Rinse and dry the arugula, and add it to the fennel slaw. Toss everything together to combine. Pop your buns in the toaster to get them warm. Time to build your burgers! 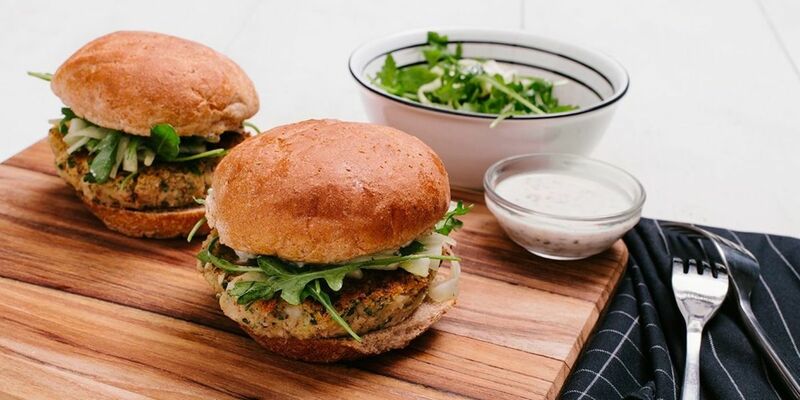 Top the toasted buns with the cannellini bean patties, the caper aioli, and some of the arugula fennel slaw. Serve any leftover slaw on the side as a small salad. Enjoy!